Today I'm having a day of blog meetings and time to spend with my dad. I decided to go for my usual minimal look and went for this thick stripy Zara top and my TOPSHOP Joni Jeans and my Aqua blue Michael Kors bag with chunky black boots! I hope you are all having a good day whether you are at work, school or if you are sitting at home!! If you have any posts you would like to read then leave me a comment or connect with me on Twitter or Instagram! Wow! Love the color of this bag! 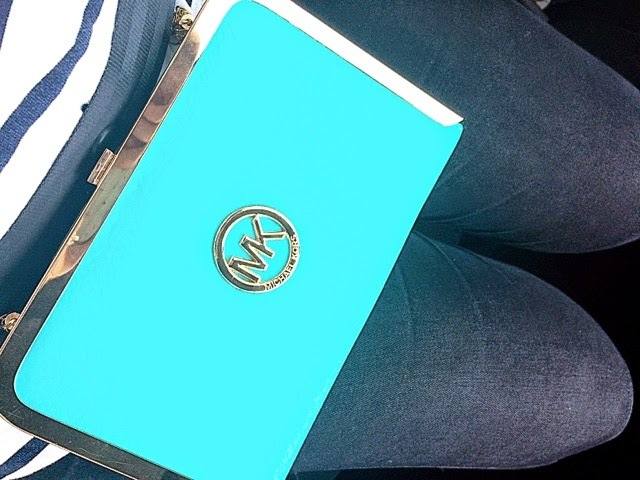 That MK bag is to die for! What a stunning colour! That Michael Kors bag is gorgeous! It's so Spring/Summery! I recently went to Kate Spade and purchased a new bag from them but part of me wishes I went with a color like yours, it's too pretty! I don't know why but MK have never really been a brand I have brought before! but i really do love the colour of this bag it is gorgeous! I love the bag it is so cute!